Objective: The purpose of this study was to evaluate the clinical and radiological outcomes of the management of triplane fractures of the distal tibial segment by using the posterior antiglide plate. Methods: Fourteen patients (9 male, 5 female; average age 14.2 years; range 12-17 years) who had closed two-part triplane fractures were enrolled. In all cases, the distal metaphyseal fracture of the tibia was reduced, and a plate was placed across the length of the fracture in the buttress (antiglide) mode, according to the shape of the posterior tibial segment that required prebending. The average duration of follow-up was 15.3 (range 12-20) months. Results: At the end of follow-up, all patients had excellent outcomes. They remained asymptomatic without any limitations to the weight-bearing function of the affected side compared to the unaffected contralateral side. Conclusions: The posterior antiglide plate may be a suitable option for the distal tibial fixation in patients with two-part triplane fractures. Triplane fracture, Antiglide plate, Posterior approach. Triplane fracture is a fracture of the distal tibia that occurs only in adolescents. As the physiological closure of the physeal plate begins medially, the lateral physis is prone to fracture . Triplane fracture indicates that the fracture lines occur in the axial, sagittal, and coronal planes and these fractures have been extensively described in the literature [2-5]. Triplane fracture is generally managed conservatively with closed reduction and the application of a short-leg cast [6,7]. However, open reduction and the application of rigid internal fixation devices can minimize unfavorable sequelae and enable successful anatomical restoration when there is advanced displacement or difficulty in maintaining closed reduction. In cases where internal fixation is applied, it is necessary to ensure that the implants do not cross the physeal line. Therefore, open reduction with stabilization using lag screws is the most common approach adopted [8,9]. However, our experience has shown that internal fixation is not always solid and stable. Antiglide plating techniques have been previously shown to achieve mortise stability and avoid the crossing of the physis by fixation devices [10,11]. So far, the application of the antiglide plating technique in the management of triplane fractures of the distal tibial segment has not been reported in the literature. This study aims to determine the clinical and radiological outcomes of treating triplane fracture of the distal tibial segment by using posterior antiglide plate. This study was approved by Institute Ethics Committee as a retrospective study. 14 patients who had sustained triplane fractures of the tibia and had been followed up for more than 1 year, including 9 male and 5 female patients with an average age of 14.2 years (range 12 to 17 years). All patients presented with two-part triplane fractures diagnosed by CT scan and had a displacement of >2 mm in the distal end of the tibia after manual reduction (Figure 1), and they were treated by the posterior antiglide plate between January 2008 and December 2012. Figure 1: Preoperative radiographs of the left ankle in the anteroposterior and lateral views showed a triplane fracture of the distal tibial segment. A. Patient #1. B. Patient #2. The operative procedure was performed with the patient placed in the prone position and with all bony prominences protected. A pneumatic tourniquet was placed on the thigh of the affected extremity. The lower limb was then prepared and draped in a sterile fashion. After exsanguination of the involved limb, the tourniquet was inflated to 200 mmHg. Then, a posterolateral incision was made midway between the posterior border of the fibula and the lateral aspect of the Achilles tendon. Next, the skin and subcutaneous tissues were sharply dissected, with special precaution to preserve the sural nerve and small saphenous vein. In cases of associated fracture of the fibula, an incision was made through the lateral aspect of the peroneus longus and peroneus brevis to expose the fracture line of the bone. Then, the flexor hallucis longus and associated soft tissue were retracted medially, allowing visualization of the entire distal metaphyseal fracture line and the posterior aspect of the tibia [12-14]. The distal metaphyseal fracture of the tibia was then reduced, and a 7-hole Straight line dynamic compression plate or Straight line locking compression plate was applied across the fracture line in a buttress (antiglide) mode according to the shape of the posterior tibial segment that required prebending. Under fluoroscopic guidance, a cortical compression screw was first used to fixate the plate to the tibia at a position proximal to the physis, followed by tightening of the screw with the foot in placed in plantar flexion, traction, and internal rotation. After the reduction of the tibial fracture, images were obtained to verify the accuracy. If appropriate reduction was achieved, the plate was compressed outside the fracture line, and three screws were used to fixate the plate, while avoiding penetration of the physis by the distal screw. Subsequently, the fibula was reduced with reduction clamps, and a plate was applied to the posterior aspect of the distal segment of the bone. The wound was thoroughly irrigated and closed in layers. Radiographs of the ankle were obtained in two planes to assess the surgical results (Figure 2). Figure 2: Postoperative radiographs of the left ankle in the anteroposterior and lateral views showed the left ankle after internal fixation. A. Patient #1. B. Patient #2. Patients treated surgically were not given any other immobilization and were encouraged to start passive early ankle functional exercises on the second day after the operation, and active exercises were initiated after the pain subsided. Partial weight bearing using crutches was allowed by postoperative 6 weeks, and the patients resumed all activities, without any restrictions, by postoperative 8 weeks. The average duration of follow up was 15.3 (range 12-20) months. The implant was removed after 1 year. The treatment outcomes were assessed using modified Weber protocol [15,16]. The protocol represented a rating system for the grading of the subjective (pain, activity), objective (function of talocrural joint, walking ability), and radiographic outcomes over a fourpoint scale for each of the five categories. The total score of five implied that the outcome was excellent; 6, good; 7, fair; and >7, poor. During the follow-up examination one year after the injury, the functionality of the affected ankle was compared with that on the unaffected, contralateral side and a radiograph of the ankle was obtained both in the anteroposterior and lateral planes to check for the presence of degenerative arthritic changes. As shown in Table 1, the types of injury among the patients were walking (n=2), falling off a chair (n=1), soccer (n=2), cycling (n=3), running (n=4), and ice-skating (n=2). Five of the patients had fibular fractures concomitant to the tibial fractures. The scores of the modified Weber protocol indicated that all patients had excellent outcomes (Table 1). None of the patient had infections, delayed union, or non-union of the fractures. The follow-up radiographs showed that none of the patients had loss of reduction, irritation due to the implants, or loosening of the implants. In all cases, the fractures healed well with smooth and regular articular surfaces. In one case (7%), the growth plate closed after one year. In the remaining 13 patients (93%), the growth plates on the affected ankles were similar to those on the uninjured contralateral side (Figure 3). Table 1. Outcomes of the patients at 1 year follow-up. Figure 3: Radiographs of the left ankle in the anteroposterior and lateral views at postoperative 12 months showed the absence of premature closure of the growth plate and degenerative changes. A. Patient #1. B. Patient #2. At one year follow-up, all patients were asymptomatic, had no limitations in the weight-bearing function of the affected side compared to the unaffected side (Figure 4). The length of the limb after operation in all patients was consistent with the construction side and showed no length discrepancy. Figure 4: At the follow-up one year after the treatment, the typical patient was asymptomatic without any limitations of the affected side compared to the unaffected contralateral side. Triplane fractures of the distal tibial segment are generally secondary to sports injuries in obese adolescents and cause damage to the growth plate and articular cartilage. If the tibial displacement is more than 2 mm or proper closed reduction could not be achieved, it is important to perform precise open anatomical reduction and stable internal fixation to ensure favorable long-term outcomes and prevent arthrosis. The posterolateral approach was first used in the treatment of pilon fractures, and subsequently has been successfully applied in fracture fixation . This approach has the advantage that it minimizes trauma because muscle coverage of the posterior aspect of the tibia is relatively abundant. In addition, a single incision is sufficient to stabilize both the tibia and the fibula, thereby minimizing the potential complications associated with the skin bridge between the two incisions . In this report, we presented the outcomes of the fixation of triplane fractures of the distal tibial segment using a posterior antiglide plate. This method of fracture fixation is particularly useful in the pediatric population because it allows for the reduction of the fracture by indirect techniques. Other advantages of this approach include the application of strong constructs, reductions in the extent of dissection and operative time, and elimination of the possibility of the penetration of the physis by fixation devices [10,11,18]. In addition, compared to previous procedures that require postoperative immobilization [19,20], our approach avoids postoperative immobilization and could achieve excellent stability, and all patients have good functional recovery. However, this study has some limitations, such as the retrospective nature, short follow-up period, and relatively small number of cases. We need enroll more patients and perform longer follow-up in further studies. To our knowledge, this is the first clinical report to describe the technique of applying antiglide plating in the management of triplane fractures of the distal tibial segment. Our results suggest that this approach is useful for the management of such fractures without compromising the integrity of growth plate. Marmor L. An unusual fracture of the tibial epiphysis. Clin Orthop Relat Res 1970; 73: 132-135. Clement DA, Worlock PH. Triplane fracture of the distal tibia. A variant in cases with an open growth plate. J Bone Joint Surg Br 1987; 69: 412-415. El-Karef E, Sadek HI, Nairn DS, Aldam CH, Allen PW. Triplane fracture of the distal tibia. Injury 2000; 31: 729-736. Ertl JP, Barrack RL, Alexander AH, VanBuecken K. Triplane fracture of the distal tibial epiphysis. Long-term follow-up. J Bone Joint Surg Am 1988; 70: 967-976. Kornblatt N, Neese DJ, Azzolini TJ. Triplane fracture of the distal tibia: unusual case presentation and literature review. J Foot Surg 1990; 29: 421-428. Weinberg AM, Jablonski M, Castellani C, Koske C, Mayr J, Kasten P. Transitional fractures of the distal tibia. Injury 2005; 36: 1371-1378. Peterson CA, Peterson HA. Analysis of the incidence of injuries to the epiphyseal growth plate. J Trauma 1972; 12: 275-281. Imade S, Takao M, Nishi H, Uchio Y. Arthroscopy-assisted reduction and percutaneous fixation for triplane fracture of the distal tibia. Arthroscopy 2004; 20: e123-128. Strohm PC, Hauschild O, Reising K, Kuminack K, Sudkamp NP, Schmal H. Clinical outcome after surgical treatment of transitional fractures of the distal tibia in children. Acta Chir Orthop Traumatol Cech 78: 97-100. Schaffer JJ, Manoli A. The antiglide plate for distal fibular fixation. A biomechanical comparison with fixation with a lateral plate. J Bone Joint Surg Am 1987; 69: 596-604. Fleming JJ, Kooner RK, Soondar S. Use of a posterior antiglide plate in a pediatric ankle fracture: a case report. 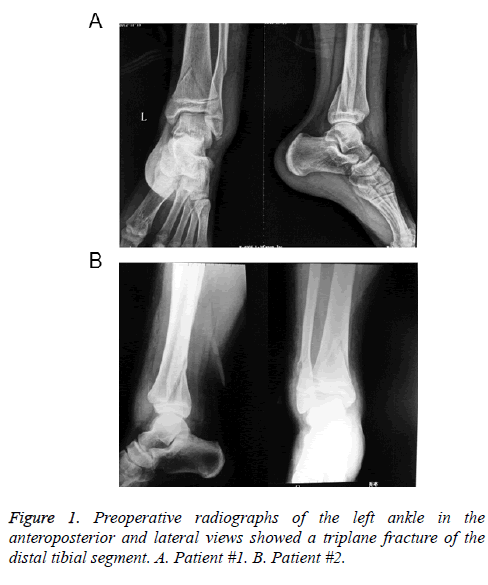 J Foot Ankle Surg 2009; 48: 469-473. Ketz J, Sanders R. Staged posterior tibial plating for the treatment of Orthopaedic Trauma Association 43C2 and 43C3 tibial pilon fractures. J Orthop Trauma 2012; 26: 341-347. Sheerin DV, Turen CH, Nascone JW. Reconstruction of distal tibia fractures using a posterolateral approach and a blade plate. J Orthop Trauma 2006; 20: 247-252. Bhattacharyya T, Crichlow R, Gobezie R, Kim E, Vrahas MS. Complications associated with the posterolateral approach for pilon fractures. J Orthop Trauma 2006; 20: 104-107. Jaskulka RA, Ittner G, Schedl R. Fractures of the posterior tibial margin: their role in the prognosis of malleolar fractures. J Trauma 1989; 29: 1565-1570. Langenhuijsen JF, Heetveld MJ, Ultee JM, Steller EP, Butzelaar RM. Results of ankle fractures with involvement of the posterior tibial margin. J Trauma 2002; 53: 55-60. Tornetta P, Ricci W, Nork S, Collinge C, Steen B. The posterolateral approach to the tibia for displaced posterior malleolar injuries. J Orthop Trauma 2011; 25: 123-126. Lamontagne J, Blachut PA, Broekhuyse HM, O'Brien PJ, Meek RN. 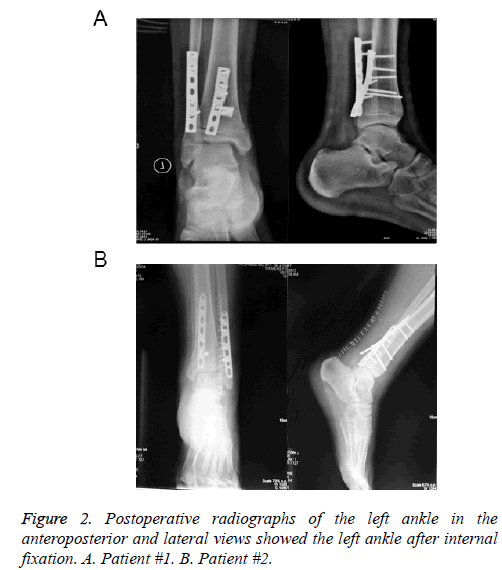 Surgical treatment of a displaced lateral malleolus fracture: the antiglide technique versus lateral plate fixation. J Orthop Trauma 2002; 16: 498-502. Tan AC, Chong RW, Mahadev A. Triplane fractures of the distal tibia in children. J Orthop Surg (Hong Kong) 2013; 21: 55-59. Ruffing T, Muhm M, Winkler H. Triplane Fracture of the Distal Fibula. Eur J Trauma Emerg Surg 2010; 36: 392-396.